People like to decorate their doors, showers, and window blinds with their own style. People can tell a lot about a person’s personality by the motif they choose. They can tell if you have a fun side or if you are quirky. Say the rest of your house is neutral because you land lord or home owners association will not allow you to paint your house they way you want it, then adding some bizarre curtains will surely liven up the place. This curtain can be used to separate a room that does not have a door. You can also hang it on a door on the way out to the pool for that tropical feeling. If you kids are into fish, they will love this hanging on their doorway. This shower curtain will definitely keep your bathroom dark. But, if you love bears or nature in general, then you should check out this curtain. With a bear sitting in the moonlight it is a little strange, but it will make your otherwise boring bathroom seem interesting to guests. This shower curtain is made from the actual material that boat sails are made from. This can protect you bathroom from the spray of the shower heard. It will come with a number inscribed on it and you can get it in two different colors. These curtains are designed by Nienke Sybrandy. These curtains have a slight gray hue with a tree in the design. The tree is made up of the ASCII code. It is perfect if you do not live out in the country, but you want that rustic view. This curtain can be used anywhere in the home. It has magnetic properties. You can push or pull the curtain in any direction and it will take the shape you want. With this shower curtain you learn all of the periodic table while getting yourself clean. This is for the ultimate science geek. If you are taking chemistry in high school or physics in college you will definitely be able to impress your teachers by knowing what the atomic number of hydrogen is. 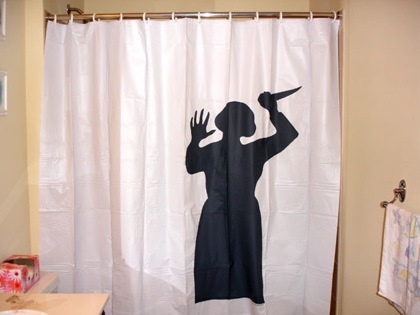 If you are a fan of the Psycho movies, then you will enjoy these shower curtains. You have two choices, one is the mother wielding the knife and the other is of Norman with the addition of blood splatters. These are for the horror movies lovers that loved this franchise. This shower curtain is just for the tattoo lovers. It is designed from the tattoo flash of the tattoo artist finest works. If you want to express your love of tattoos, then having this hanging in your bathroom will let your guests know where your heart lies. This curtain starts out innocent enough, until it determines that you are spending to much time in the shower. After about for minutes in the shower the spikes on the curtain start puffing up and taking up all the available room in the space. You will get so frustrated that you will be done taking your shower. It is meant to force you into conserving the Earth’s water supply. These curtains are for the person that loves animal print motifs. You have your choice of cow, pony, cheetah, leopard, zebra, giraffe, tiger and they even offer camouflage for those that hunt these animals. If you have an animal themed room, you can now have curtains to match.